We’d love your help. Let us know what’s wrong with this preview of Wyrd Worlds by Steph Bennion. To ask other readers questions about Wyrd Worlds, please sign up. It was okay. Just. Barely. Normally anthologies front load good stories to set the hook, then put mediocre stuff in the middle and end with a bang. Wyrd Worldsidn't do that arguably the worst stories were the third and last. The rest were okay. Only one, "Guns of Napoleon," rose enough above the tide to merit comment. It's close, but my favourite is The Invisible Invasion. Since I am one of the contributing authors to this anthology, I will comment only on the work of the other authors. I really enjoyed this anthology. I've always believed that you can tell practically any kind of tale within the construct of speculative fiction. The contributing authors have demonstrated this concept very well. There is something here for almost everyone. The stories vary in length, style and subject matter, but they are unitied in the common theme of untamed imagination. Some of Since I am one of the contributing authors to this anthology, I will comment only on the work of the other authors. Some of the tales are companions of the author's existing works. Many of the stories were written especially for this collection. All of them are written by talented independent authors. Editor and Chief Author-Wrangler, Steph Bennion has pulled together an ecclectic pack of authors to create this anthology. There is a spirit of camaraderie between these people that is uncommon in this field. That's probably enough about the authors. What about the stories? In this book there are fantasies featuring worlds of magic, political intrigue, dark forces, mystery and romance. There are stories of cutting edge physics, futuristic warfare, space stations, and intersteller travel. Some feature aliens, time travel, alternate histories, and questions about the nature of existence. I’m sure literary salons still exist in the major cities, where the literati get together and discuss their work in beautifully-lit rooms over drinks and catered treats. If invited to one of these, I would be the guy in the outermost ring of conversation, going back and forth from the buffet table to the bookshelves, listening in, probably not initiating any conversations unless I saw someone like myself pick up a book from the shelves that I had also read. If someone was taking pictures, I woul I’m sure literary salons still exist in the major cities, where the literati get together and discuss their work in beautifully-lit rooms over drinks and catered treats. If invited to one of these, I would be the guy in the outermost ring of conversation, going back and forth from the buffet table to the bookshelves, listening in, probably not initiating any conversations unless I saw someone like myself pick up a book from the shelves that I had also read. If someone was taking pictures, I would only get in by photobombing it. Instead of physical literary salons to attend, I have Goodreads Groups. I ‘listen’ in on interesting conversations a lot more than I participate, and most of the time I’m reading my ‘friend’s’ reviews, or comparing their read books list to mine. When writers in the Smashwords Authors group began setting up an anthology in the summer of 2013 I managed to storybomb my piece, “Separate Wars on the Same Street” into this anthology. To read some background on my story, go to this blog post [http://oralrandomly.blogspot.com/2014...]. Reading this anthology is like going to an intimate story reading: it will give you a sense of some of the excellent work being created and published on Smashwords (and elsewhere); wildflower worlds and characters that bloom outside of the influence of mainstream publishing house nurseries. I'm in the anthology, so I didn't count my own story. I divided the star rating by 13 stories. Excellent variety of stories, make great quick reads for break time. A series of short stories that take place in different realms. Some are introductions to other series of books. Most were at least interesting. 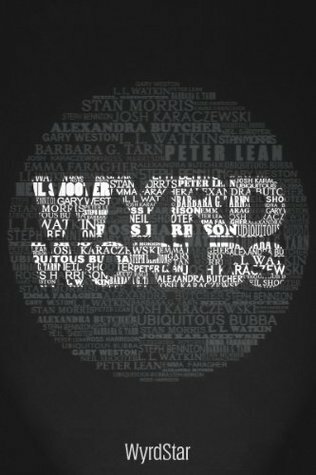 Wyrd Worlds is an anthology containing stories by fourteen international sci-fi and fantasy indie authors. Many of the stories did nothing for me, and typos abound, but since the book is free, I'm not complaining. 'Explain That To a Martian' by Gary Weston, and 'Kira' by Ross Harrison are both worth a five-star rating. 'The Imaginary Invasion' by Ubiquitous Bubba, and 'Casualty' by Neil Shooter are worth four-star ratings. The rest drag the overall rating down to two point seven, so I round 'Wyrd Wyrd Worlds is an anthology containing stories by fourteen international sci-fi and fantasy indie authors. Many of the stories did nothing for me, and typos abound, but since the book is free, I'm not complaining. 'Explain That To a Martian' by Gary Weston, and 'Kira' by Ross Harrison are both worth a five-star rating. 'The Imaginary Invasion' by Ubiquitous Bubba, and 'Casualty' by Neil Shooter are worth four-star ratings. The rest drag the overall rating down to two point seven, so I round 'Wyrd Worlds' up to three stars. This is an excellent science fiction anthology by a variety of good writers. I got into most of the stories and was left with wanting more. A couple of the stories could have edited a little better. A nice selection of science fiction and fantasy, by as yet largely unknown authors. Anyone interested in science fiction will find some thought provoking stories here. Well done on this first anthology - I look forward to reading the second Wyrd Worlds. There are a handful of really interesting stories in here. Skip anything that doesn't catch you in the first page or two, focus in the good stuff. This is an interesting collection of stories, some of which are very entertaining.